All the topsides plywood is glued in place, which means it was time to dust off the electric planer and start shaping the waterline chines. After a few minutes, the planer slowed down & ball bearings started appearing. The pic shows the old Bosch 25-82 planer, which gave many years of good service, and the new Bosch 26-82 planer. On the right is the piece of GMC junk which lasted 5 minutes before the blades went blunt on the cured epoxy. It's definitely worth the extra money for a quality planer! 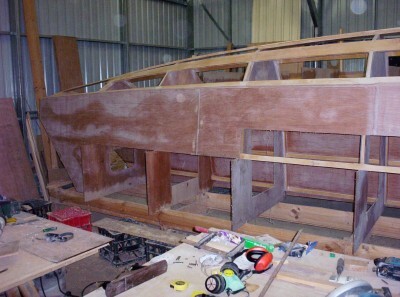 This pic shows the waterline chine taking shape.